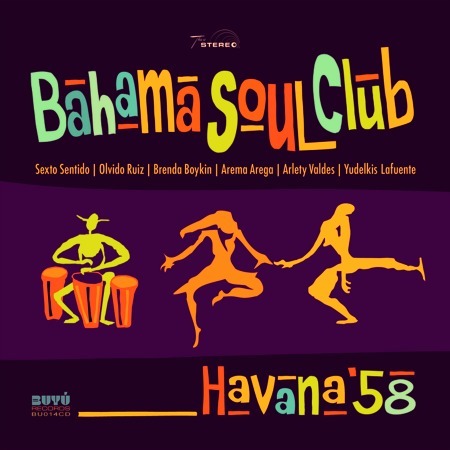 Bahama Soul Club’s 4th album “Havana ’58″ presents a musical homage to Cuba’s roaring years before the revolution. Glittering nightclubs and outrageous cabarets, fashionable hotels and backstreet brothels, empty wallets and bemusing décolletages. Rumba is everywhere. Once again featuring a host of talented guests, “Havana ’58″ sees Cuba’s leading vocal quartet Sexto Sentido surprise us with traditional Yoruba chants in “Eleggua”, irresistible complex harmonies in the magnum mobster opus “Meyer-Lansky” and show us some disco love in “Tropicana Flight”. The vivacious Olvido Ruiz, singer in the Bahama Soul Club live band presents the full bandwidth of her expressive vocal ranged from boogaloo (“Muévelo Papi”) to lounge (“Night Breeze”) up to the dark 6/8-ballade “Let God”. And once again we find the lovely Arema Arega with rolling “Rumba Fugaz”. With their previous albums Bahama Soul Club established an elegant and percussive cocktail of Latin Jazz, Soul, Bossa and Boogaloo, to which they now add the dark, sensual and alluring mystic of Tiki and Exotica into the mix.